BELIEVER! Collection vol.1| RPG Maker | Create Your Own Game! Now you can bring the marvelous Believer! world to life on Visual Novel Maker!! Battles, romance, love and relationships are all packed in the world of Believer!, a beloved visual novel released by D3 Publisher. Now you can bring the marvelous Believer! world to life in your own Visual Novel Maker project! Believer! Collection is a 3-part series of stunning graphics - including both unique characters and gorgeous backgrounds. Spanning across all 3 volumes, there is a total of over 3800 characters illustrations and 68 backgrounds that are waiting to be used! Collection 1 focuses on Earth's guardians and their home; sleek and modern-day school settings that can help you create both a cozy home and a place to find adventure and romance. 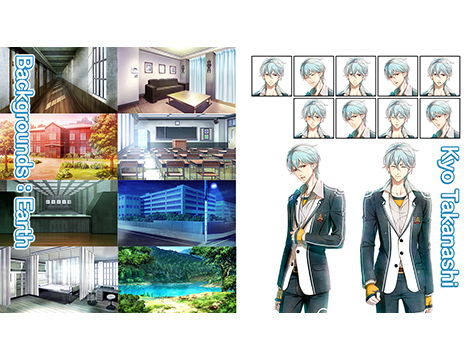 With 11 expressions for each of the 5 characters and 13 locations to explore, you're sure to find the perfect set of visuals for your non-commercial Visual Novel Maker projects. 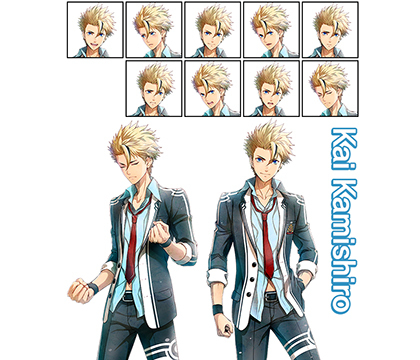 5 lead guardian characters: Kai・Ren・Omi・Kyo・You. All characters come with 2 poses, each pose with 11 expressions. 33 Backgrounds from 13 locations; Many of these locations have Morning / Evening / Night versions, makes a total of 33 background graphics. Details as follows: Hallway（Morning, Evening, Night), Infirmary（Morning, Evening 1&2, Night with and without lights), Garden（Morning, Evening, Night), School Outside 1（Morning, Evening, Night), School Outside 2（Morning, Evening, Night), Classroom1（Morning, Evening, Night), Classroom2（Morning, Evening, Night), School Stairs, Training Grounds, Forest Park（Morning, Evening, Night), Living（Morning, Evening, Night), Heroine room, Omi room.